On-line once more as from 2010!!!!! Let’s hear it for Alfred! 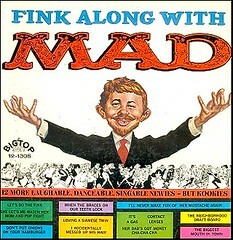 Mad Magazine released two great albums in the early 1960s. A wonderful symbiosis of Mad humour and rock´n´roll. Produced independently by Norm Blagman and Sam Bobrick who then played it for the Mad staff who then saw to it that it was released. Now, let’s do the pretzel! 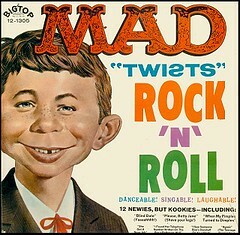 >Download ("Mad Twists Rock´N´Roll" zipped) at files.ww. >Download ("Fink Along With Mad" zipped) at files.ww. Also: Scar Stuff has All the Eight Endings to the "MAD Mystery Sound" flexi "It's A Super-Spectacular Day". Absolutely great! this better be in the Library of Congress, or I'll riot! She was a Prehistoric Sexpot! Percy Trout's "a taste of summer" Mix! Bruno Nicolai and "Agente Speciale LK"
Listen to and Download Percy Trout! Is it a bird? Is it a plane? No it's a Gorilla.